Project “Fighting plastic pollution in Cyprus: The Responsible Beach Bars Initiative” has been recognised as an innovative social initiative and therefore awarded by Beyond Plastic Med organisation (http://www.beyondplasticmed.org/). This initiative aims to engage beach bars, snack shacks and beach restaurants (henceforth called beach bars), strewn around Cypriot beaches, to take ownership of ‘their’ stretch of beach in order to protect it and minimise the amount of marine litter, and especially plastic, left on it by their customers and in general beach goers. The Initiative was launched on 28 June 2017 in Paphos, in the presence of His Excellency the Spanish Ambassador in Cyprus, Mr Angel Lossada, and the Mayor of Yeroskipou. 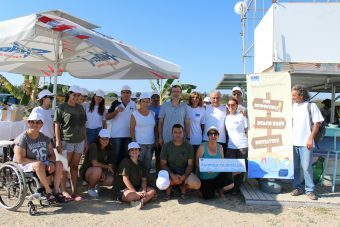 The launch event included a beach cleanup with the participation of students from Paphos Technical School and other volunteers, as well as informational campaign to the beach bars of the area. Some photographs from the launch Event are available here. The Event was also covered by CYBC news, and you can see the relevant Video here. Project “Fighting plastic pollution in Cyprus: The Responsible Beach Bars Initiative” will achieve its aims through six interrelated activities, which are presented below. (1) Organisation and implementation of a workshop bringing together stakeholders from around the island to record their opinions and views with regards to plastic waste, to identify the problems they face with regards to its management and to pinpoint easy to implement and effective solutions for its management. Three workshops were organised within the framework of the project: one with the local authorities responsible for Blue Flag beaches in Cyprus, one in Paphos with key stakeholders and one in Nicosia with the collaboration of the Spanish, Italian and Portuguese embassies on the island. (3) Awareness-raising campaign in the summer of 2017 targeting all beach bars on the island, where the Guide and a Decalogue of Good Practice will be disseminated. The awareness-raising campaign involved visiting beach bars around the island, sharing information about marine litter and encouraging them to become members of the Responsible Beach Bars Network, by adhering to the Decalogue of Good Practice (Decalogo EN_F Decalogo GR_F). The Responsible Beach Bars Network Members are visible on this Map. Selected photos from the Beach Bar Visits are available here. (4) Launch a competition for sustainable practices implemented by beach bars around Cyprus. The competition was launched in March 2018, in collaboration with the Pancyprian Association of Entertainment Venue Owners (PASIKA). The deadline for the competition was the 31 March 2018. (5) Organise an awards ceremony for the winning beach bars. The Awards Ceremony, which took place on 24 April 2018 on board the vessel M/V DOREMI, was a great success. In addition to the awarded beach bars, attendees included the Mayor of Larnaca, Mr Andreas Vyras, His Excellency the Ambassador of Spain, Mr Angel Lossada, Her Excellency the Ambassador of the Kingdom of the Netherlands, Ms Nathalie Jaarsma, representatives from the British High Commission and other distinguished guests, including representatives of the Cyprus Association of Recreation Venue Owners. There was extensive coverage of the ceremony in local media (both online and print), including CYBC’s morning news broadcast (click here to view the broadcast clip).